From the Mail Settings page you can enable, disable or edit the messages that are sent automatically for different actions. New ad created: Sent to users when a new ad is created. Guest Poster Edit Key mail: Guest poster will receive a key in email based on which he will be able to edit the posted ad. New message: Sent to the author when he receives a new reply from users. Admin - ad blocked: Sent to users when an ad has been blocked by one of the administrators. Admin - ad reported: Notify admins related to ad reported. Admin - ad closed by admin: Sent to the user when an admin closes his ad. Admin - user blocked: Sent to the user when his account was blocked by admin. Ad closed: Sent to users when an ad is closed. Ad about to expire: Sent to users the day before the ad will expire. Watchlist - ad added to watched category: Sent to users when a new ad is added in a watched category. 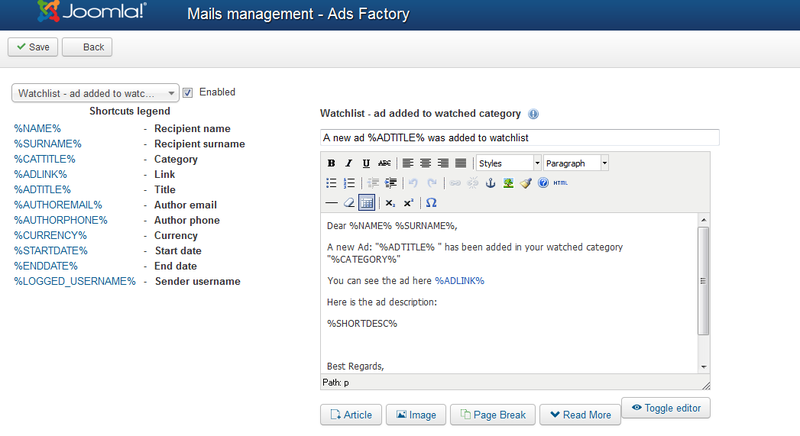 Watchlist - ad will expire: Inform users when a watched ad is about to expire in 24 hours. Watchlist - ad canceled: Inform users that their watched ad was canceled. Watchlist - ad closed: Inform users that their watched ad was closed. Ad reported - Inform the user when his ad has been reported. Send to Friend Mail - The email content of a "Send to friend" recommendation. New admin message: Sent to users when they a message from the administrator. Admin - ad pending approval: Sent to the admin when a new ad is posted and awaiting approval. Admin - ad approved: Sent to users when an ad was approved. Admin - ad unapproved: Sent to users when an ad was unapproved. On the left side of the editor, you will find a list of shortcuts that you can use on the text editor. 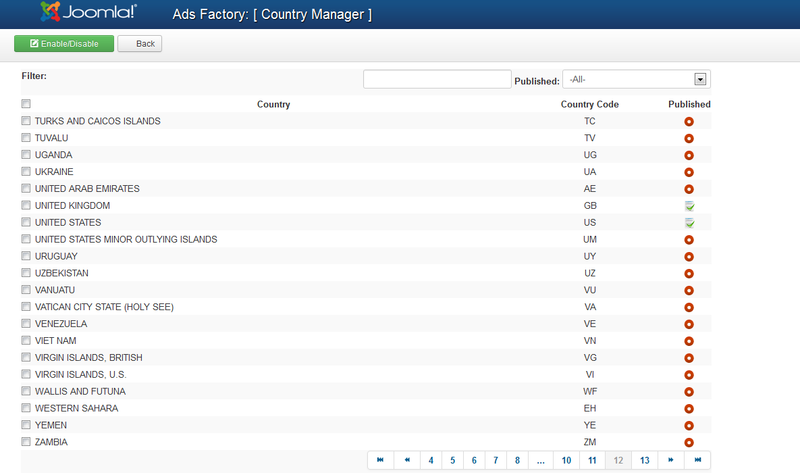 The Countries Manager pages allows you to set up which countries are published and which not. From the Import/Export page you can create a ".xls" file containing a list of all the available ads from your website or import ".csv" files, adding additional ads. With Import CSV you can import data as a bulk upload, which will append the data to your existing database. This will help, for example, with populating your database much more easily, uniting the existing records which are kept in different formats. To import a CSV file, click on the Browse button, select the file from your HDD and click on the Upload button found at the top of the page. Having a .zip file containing images of these ads can also be uploaded the same way with the provided field. It is important to know that this feature requires strict conventions in the files in order to work properly. Each value is inserted in the database and the elements order must be respected. Custom fields are not supported. For sample data and other info about the BULK import feature please check this forum thread. Export XLS will save an Excel spreadsheet with all the ads on your website in your desired location.